More than half of French consonants are very similar to their English counterparts, while a few are completely different. Here’s a quick overview to help you get started learning French. Click any letter for detailed information and sound files. 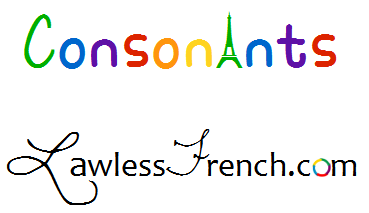 See the main consonant lesson for some general notes about French vs English consonants as well as more detailed information about French consonants in general. Self-study checklist with lessons, quizzes, and comprehension exercises.